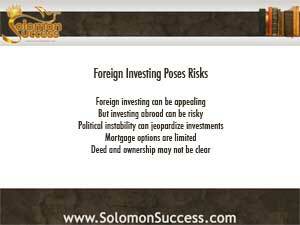 King Solomon was no stranger to investing outside the boundaries of his kingdom. The Books of Kings and Ecclesiastes tell us that he sought materials for his great temple from many neighboring kingdoms and countries, and he entertained rulers of these lands in royal style, building connections through investment, trade and marriage. Foreign investment has always had its appeal. Now, as foreign investors flock to buy US real estate, American investors are also looking to buy properties outside the country. But beneath the glamour of foreign investment lie a number of pitfalls for American investors abroad.